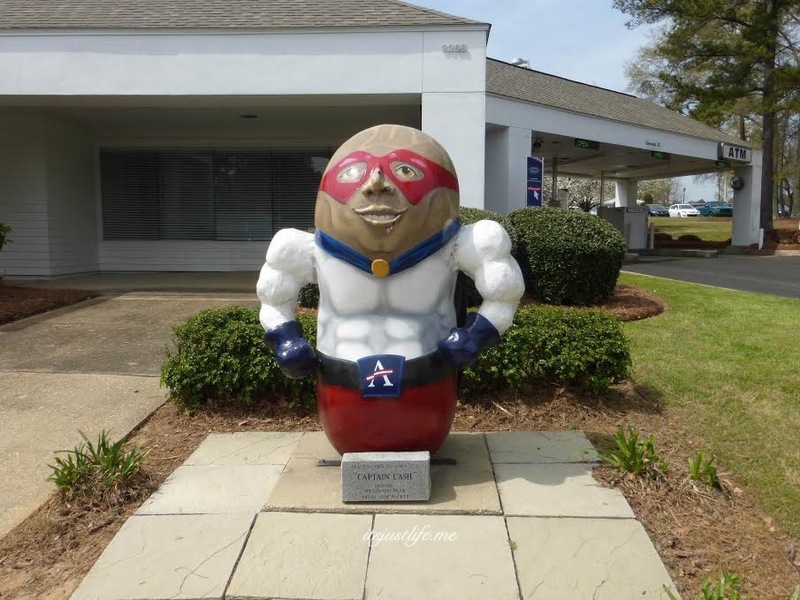 When Chris was considering taking a new job in Dothan, Alabama I immediately went online to do a bit of research about the area and I was thrilled to find out that it is an area that is rich with culture and activities that promised to pull me in. As I am exploring the area in real time and in real life now I am thrilled to find a plethora of wonderful things to photograph and share on It’s Just Life. One of the things that I was seriously most excited about was the fact that there are more than 60 4 foot tall painted peanuts around town. You might remember the Golden Peanut that I shared when I announced that we were going to Alabama. Dothan is host to the National Peanut Festival every year so yes—painted peanuts make total sense to me. 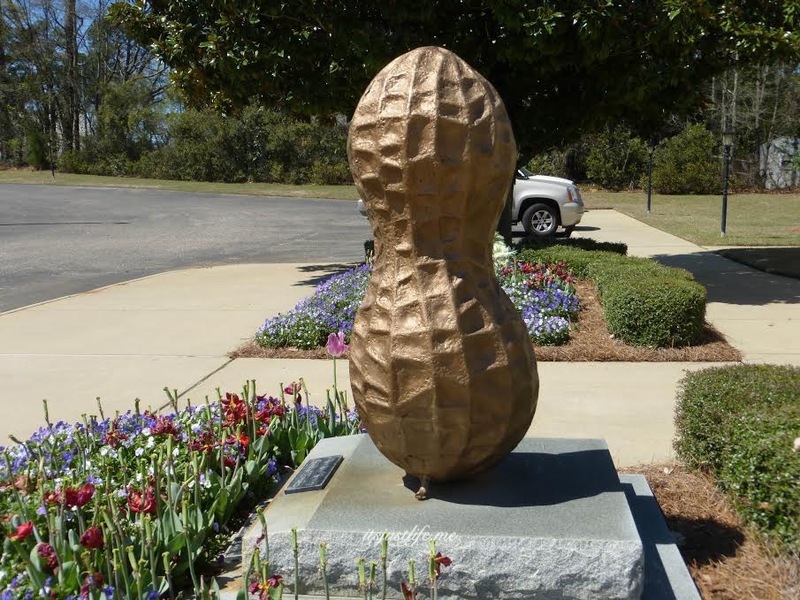 Dothan boasts being the Peanut Capital of the World. Come on, you guys, you know Mr. Diamond only takes me to the best places, right? So I am starting the search. I have my official Peanuts Around Town map with all of the locations listed. I have my hiking shoes, my GPS and am ready to scout out the locations. Today I will share a few that I have photographed but trust me – this will be an ongoing series because I don’t want any of you to overdose on too many peanuts. 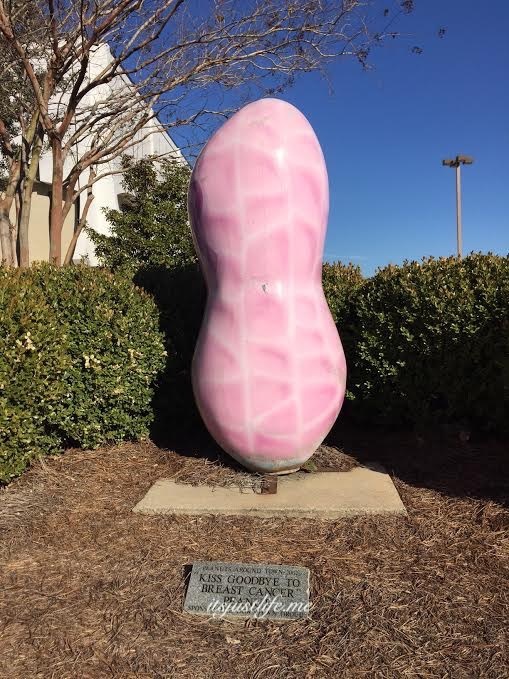 This one is accurately named Kiss Goodbye to Breast Cancer Peanut sponsored by The Downtown Group at 111 N Saint Andrews Street in downtown Dothan. We happened upon it when we went to get our utilities set up and I was happy to snap a quick picture. Many businesses have the peanuts outside their places but this one we found nestled in a corner inside the TGI Friday’s we stopped at for lunch one day. 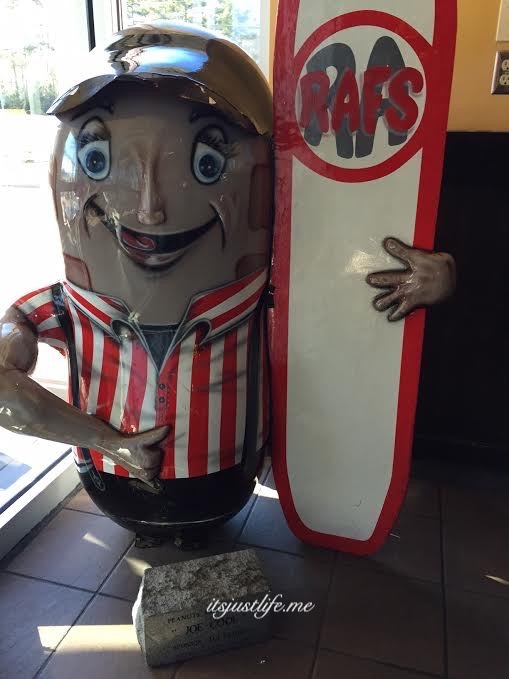 Joe Cool was amazingly cool and I fell in love with this surfer peanut. We found this dude outside the 3 Minute Car Wash and even though he does not show up on the official map I think he is pretty amazing. He is all ready to wash your windows after your car is washed. 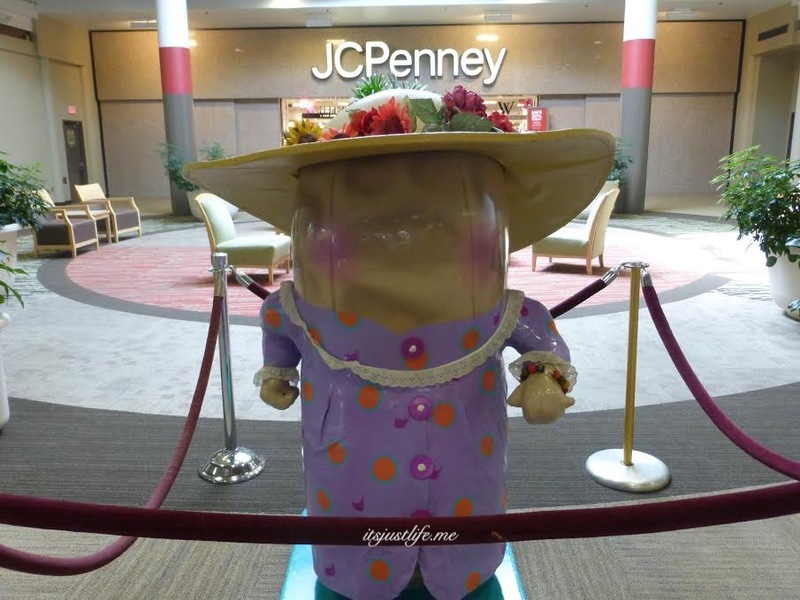 A trip to the Wiregrass Commons Mall and I found this lovely Gone Shopping peanut hanging out outside of JCPenney’s. She is missing her shopping bags but I bet I could help her with those, don’t you? I had to ask 3 people before I found her . Lesson learned–just go to the mall office for any information. Captain Cash is the peanut to call when you find yourself in a financial jam. He hangs out in front of Ameris Bank on Ross Clark Circle and appears to be keeping a cool eye on all of the comings and goings. Of course Elvis made an appearance because everyone loves Elvis, right? 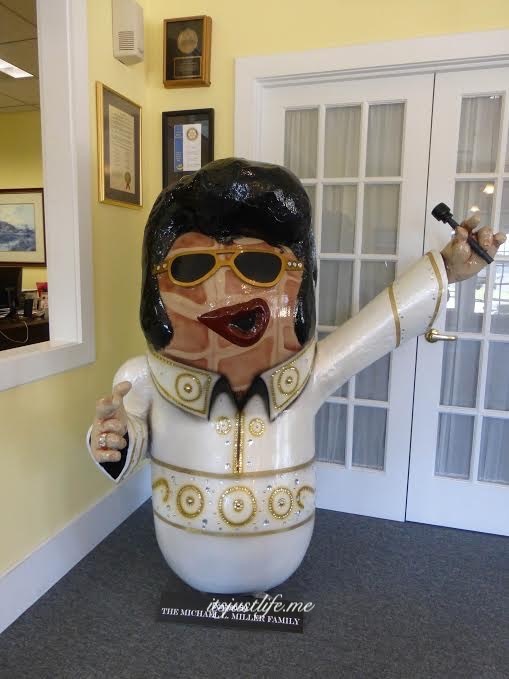 Apparently the Elvis peanut continually got stolen so he has been permanently relocated inside the Dothan Area Convention and Visitor’s Bureau located at 2841 Ross Clark Circle. He is pretty amazing. So that does it for the first Peanut post. I know this is going to be a fun series and I am going to find them all before too long. Some of them are going to be more difficult than others to get to but trust me – I will leave no peanut unturned. Thanks for coming along today –leave me a comment and tell me which one is your favorite today. What’s On Your Camera Roll? Here’s My Past Two Weeks Recap! That Elvis peanut is seriously cool. I see why he’s been stolen. I’m not feeling the love for the pepto bismol pink breast cancer peanut, however. The color is somewhat off-putting for such a great cause. What a fun to explore a new town! The Elvis one is adorable. There are really some fun ones and it is going to take a while to find them all and take pictures. Some are easier to get to than others. I agree the Breast Cancer one needs a bit of spiffing up. Thanks for stopping by! Glad to see that you are taken getting acquainted with your new community in such good fashion. Most people wouldn’t actively seek to really get to know a new town like you are. That is why you are so adaptable. I think it is important to dig in and get acclimated to a new place as soon as possible. It all helps in the process. Thanks, Ozzie. Favorite? Elvis, of course. What a great idea for the Peanut Capitol of the World. I look forward to seeing more of these nuts. And you will! Just gotta track em all down. Next visit in 3 weeks so hopefully then I will add to my collection. He does take me to fun places, doesn’t he? Elvis definitely is a fun one! Well, seeing as how hubby and I own a car wash….. CUTE idea. Our town of Smithfield (VA) is the ham capital of the world, so we have painted pigs all around; you’ll have to come check them out! There aren’t that many: you could see them all in….oh about 15 minutes! I love painted pigs! NC has some because of BBQ but I can’t remember what town. Painted anything gets me –especially if they are easy to pose with! Kiss Goodbye to Breast Cancer!! I’m not sure which is my favorite so far – Captain Cash or Elvis! I love hearing all about Dothan. I can tell it is a good fit for you two which makes me happy, even though you’ll be leaving Iowa. They are so fun! I am finding so many great things about Alabama already and I am not even moved here yet! My favorite is that peanut you were hugging because it’s adorable! I am so serious when I say those roasted Alabama peanuts you sent us were the best ones we’ve ever tasted. I have yet to taste a peanut in Alabama……..I need to change that immediately. Beth Ann, thank you soo much for posting such a fun blog on Dothan, AL!! We are happy to have you here and hope you like living here as much as we do! As far as tasting an Alabama peanut, stop by Nuts to go for fresh boiled peanuts as well as many other offerings. Their address is 2005 S. Brannon Stand Rd. Also, Shute Pecan is a fun place, where they will even show you some of the cracking process for local nuts :). Their address is 1475 Ross Clark Circle. Also, stop by the CVB (Visitor’s Center) again and I will have a Dothan Car Magnet for you! Thanks so much for sharing! Thanks, Carmen! This is the first of many posts!!! I spent one afternoon at Dothan Area Botanical Gardens and Loved that as well. There are tons of great places to go and I am thrilled to discover it all! I will def stop in when I am back in town for that magnet!!! You think? 🙂 Yum–peanut butter pie sounds amazing. We have a house on Lake Martin near Dadeville Al. Maybe sometime we can meet there for a weekend on the lake! Really? Now I have to go look at a map! Thanks Carl!!!! There will be more. And more. And more! 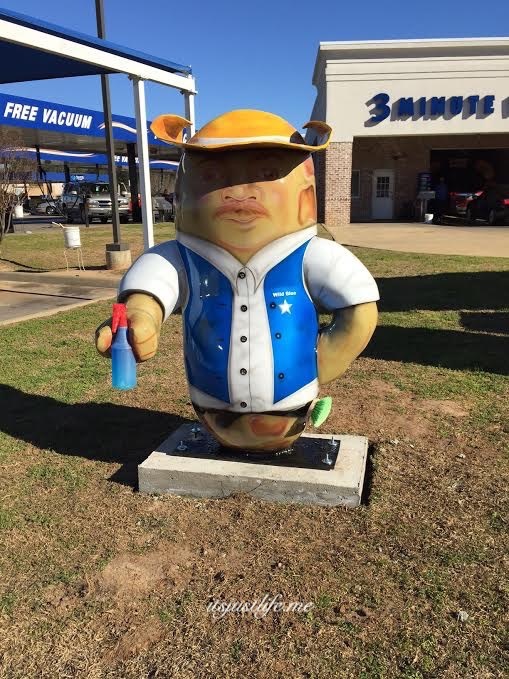 I’ve got to say I think the Elvis Peanut is the most clever with it artwork and the 3-Minute Car Wash guy is pretty cool! There HAS to be a place named “Goobers” it’s just cries out for recognition. Like Goober’s restaurant.. “We serve soup to nuts”.. Or a gas station. Goober’s Shell..
Oh Jake. Perfect!!! I will look for Goober related places. So far I have not seen any! Wanna start one???? I love them ALL! So fun! I can’t wait to see more! That’s a lot of peanuts. The Elvis one made me laugh. He is my favorite so far. How fun! For a while, we had ceramic cows stationed around town. They’d popped up everywhere. The cows were painted in colorful themes or patterns. There was a cow in a tuxedo and top had near the theater district. Oh I would have loved seeing those cows. Anything like that tickles me. One place we visited had dolphins—I will have to ask Chris where that was or go back through my pics. Fun ideas. What a hoot with the peanut! They are all very fun and dressed all different ways. I can’t wait to find them all. And YES–corn would be awesome! I enjoyed the nuts.. I think it would be lots of fun to look for all the nuts there,I know a couple of nuts here but they are talking ones. You are so funny. The nuts are a lot of fun and I am going to have such a good time finding them all. I’m glad I don’t have a peanut allergy! Love the Elvis peanut. What a great way to explore your new city. The Elvis one is pretty much my favorite because he has so much personality! I think I would have to say the Elvis one is my favorite because it has so much expression!